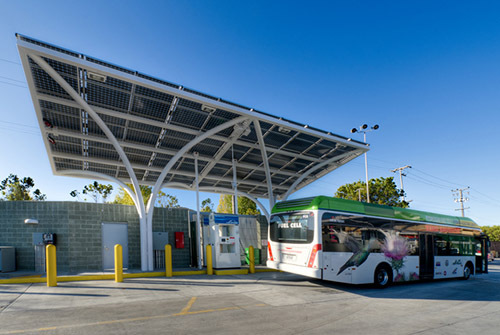 Hydrogen stations are in operation and under construction for light-duty vehicles (passenger vehicles), heavy-duty vehicles (trucks and buses), and material handling equipment. 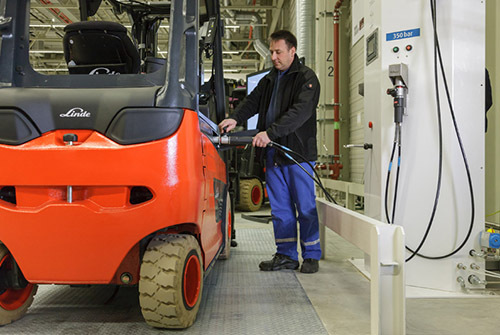 Stations dispense hydrogen as a compressed gas at pressures of 10,000 psi (H70) for light-duty vehicles and 5,000 psi (H35) for all other vehicles. 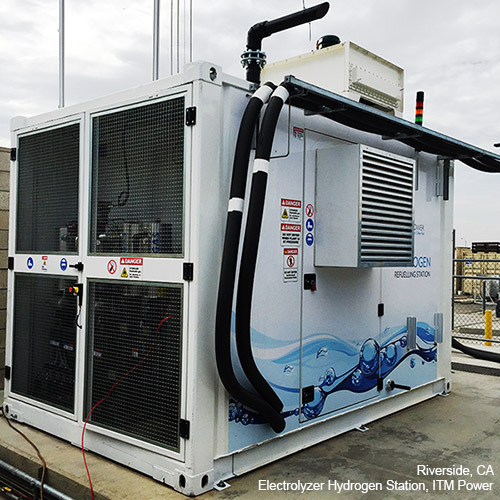 Above-ground hydrogen storage equipment – based on the station’s location and capacity, hydrogen can be stored as a liquid, a low-pressure gas, or a high-pressure gas. Storage tanks follow ASME standards. 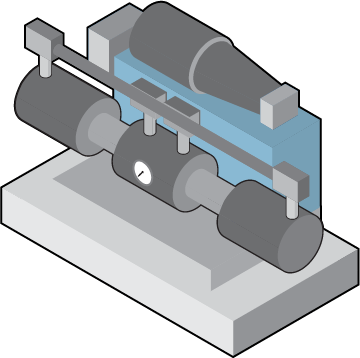 At least one compressor – Hydrogen is compressed to reduce volume and increase pressure. Typically, a compressor is used to replenish the buffer storage. Liquid and low-pressure storage tanks may use multiple compressors. 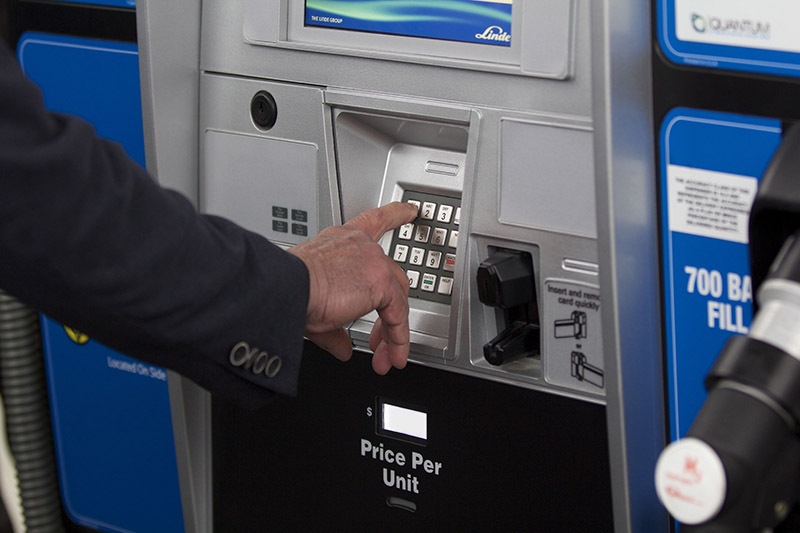 At least one dispenser – Dispensers look similar to gasoline dispensers. They may sit on the same island as other fuel dispensers, or sit on their own island. Dispensers for material handling equipment are usually inside the warehouse. Stations for light-duty vehicles are mostly retail stations—open 24/7, have unattended fueling, accept common credit/debit payment methods, and are conveniently located primarily at existing gas stations. Fuel cell cars fill their tanks in under five minutes. Transit buses and trucks typically use private fleet or truck-stop-like stations and fill their large tanks in about 10 minutes. It is unlikely that heavy-duty vehicles will use passenger vehicle stations. Stations for material handling equipment often have the storage and compression outside, but the dispenser inside the warehouse or factory. Operators self-fuel the vehicles in about three minutes using H35 hydrogen. Industrial gas merchants in North America produce more than 15 million kilograms of hydrogen a day, mostly for oil refineries and manufacturing, and deliver it by pipeline, truck, rail, and barge. Hydrogen can also be produced from a variety of renewable sources. 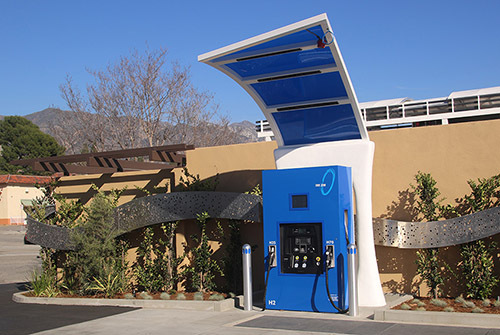 Hydrogen stations have a choice of having hydrogen delivered as a liquid, delivered as a gas, or making hydrogen on site. 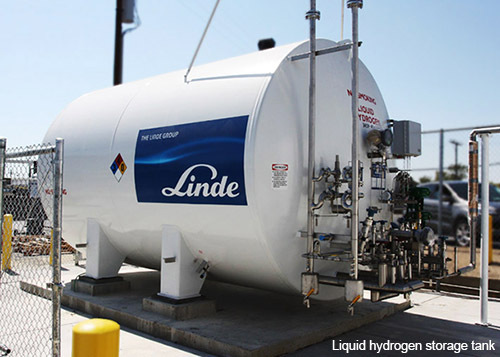 At hydrogen stations with liquid storage, a tanker truck pumps hydrogen into an above-ground tank where it’s held at a cryogenic temperature. 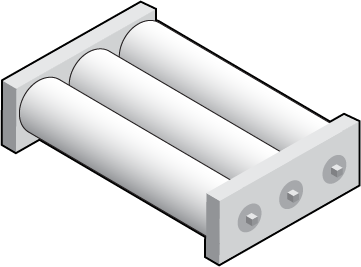 Liquid hydrogen is vaporized, compressed, and stored in above-ground cylinders for dispensing. As customers fuel their vehicles, the gaseous hydrogen cylinders are refilled. Liquid storage generally requires more space than gaseous storage. Hydrogen can be delivered as a gas at pressures up to 7,200 psi. Cylinders are mounted into a trailer and the truck driver “refills” the storage by swapping a trailer of full cylinders for a trailer of almost-empty cylinders inside a walled storage area. Stations can also make hydrogen onsite by electrolysis of water and reforming natural gas or biomethane. At some locations, a station could use hydrogen from an existing pipeline. All three methods result in gaseous hydrogen that must be compressed and stored, and all require more equipment and space than either option for delivered hydrogen. One of the advantages to renewable hydrogen is the future opportunity to sell Low Carbon Fuel Standard credits. Hydrogen is a non-toxic, environmentally benign natural element has been safely used in manufacturing for more than 90 years. It is a very small, diffusive molecule that is 14 times lighter than air. 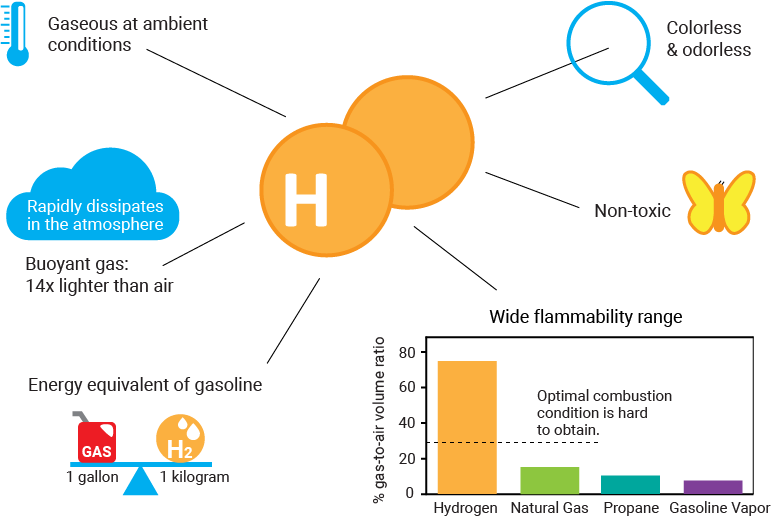 Like all fuels, hydrogen is flammable and safety systems at the station and in the vehicle are designed for hydrogen’s properties. 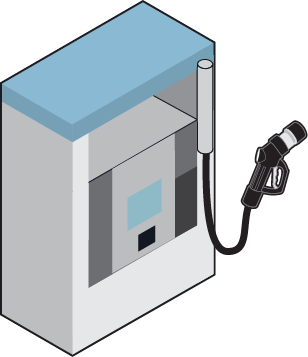 Hydrogen stations have standardized safety systems that include grounding, breakaway hoses, and fire sensors that are common for all fueling stations, plus sensors that measure pressure, temperature, and leakage of gaseous hydrogen. 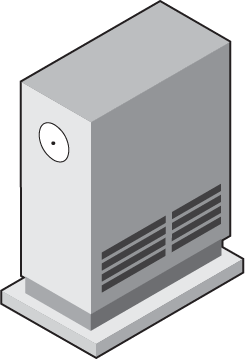 Stations are designed to safely vent hydrogen in case of an extreme emergency, such as a gasoline fire that increases the temperature of the stored hydrogen. Although the illustration shows a passenger vehicle, stations for heavy-duty and material handling vehicles use the same safety standards and systems. 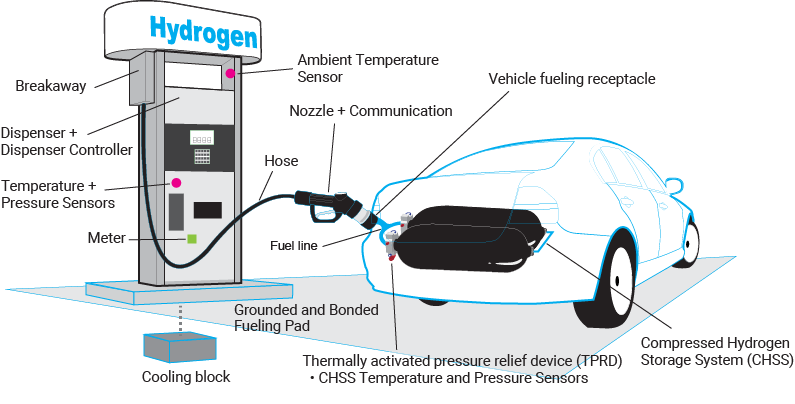 Hydrogen stations are designed to be self-service and operate similarly to fueling with compressed natural gas. Stations for cars are designed for consumer retail sales (accept credit cards, adhere to state standards for measurement and fuel quality). Stations for heavy-duty vehicles and material handling equipment may use a PIN or key to identify the person fueling. When a vehicle operator activates the dispenser, hydrogen flows from the storage tanks to the dispenser and through the nozzle into the vehicle in a closed system. Initial safety checks ensure the integrity of the system before fueling starts. During the fill, the dispenser is designed to pause periodically for several seconds to conduct additional integrity checks, according to code and/or fuel protocol, and then resume filling. Most vehicles have a standardized communication system that sends parameters from the vehicle’s fuel storage system to the dispenser, which are used to calculate the pressure to stop the fill at a “full” tank. A car can fill up in less than five minutes.